At the law office of Farris, Riley & Pitt in Birmingham, Alabama, we are fully committed to helping you obtain the justice you deserve for the serious injuries and losses you sustained as the result of someone else's negligent, careless or unlawful actions. Serving plaintiff clients throughout the Greater Birmingham metro area and all across the state, our attorneys possess decades of combined legal experience, and for more than 20 years now, our law firm has been the trusted source for quality representation and support to innocent accident victims and their families adversely affected by motor vehicle accidents, industrial accidents, medical malpractice and nursing home abuse, defective products and dangerous medications, railroad accidents, and more. Personable and responsive, we promise to treat you as if you were a member of our own family as we aggressively pursue the maximum amount of compensation you deserve, and we will remain accessible to promptly return your calls and emails, and offer updates as to the status of your case. As evidence of our success, our law firm has recovered millions of dollars on behalf of our clients, including numerous multimillion-dollar settlements and awards. And while we cannot guarantee a specific outcome regarding your case, we can promise to protect your rights and interests while we work diligently toward helping you achieve the favorable outcomes you seek. Do not face your battle alone. 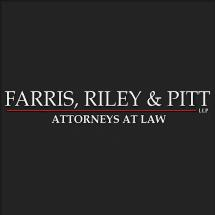 By contacting Farris, Riley & Pitt and taking advantage of our law firm's free initial consultation as soon as possible after your accident, you can increase your chances of securing a brighter future for yourself and your family.